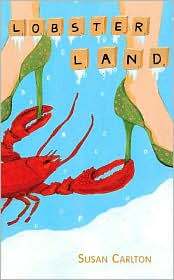 Life on an island off the coast of Portland ME is fairly bleak (pun intended) but Charlotte has plans to escape to boarding school. However, there's her boyfriend, hapless (but potentially fugitive and definitely Scrabble-obsessed) Dad, and her siblings with whom to negotiate. And there's the small matter of getting the applications done as well! A book which scores more from its witty writing than its story. The constant sarcasm gets a bit tired by page 90, but it has appeal (reminding me a bit of Cyd from Gingerbread). I really wanted to like this girl. But the story treads water. I'll have to also admit that my opinion was impacted more than a little by the liberal use of profanity in the writing. This is a source of intense debate in YA (whether to swear or not). I see how it can add authenticity and emotion to a story (and I'm certainly no prude in my own life) but the rather heavy use of F-bombs and A-words by Carlton dilutes their utility. I think less is more in this case.